You just got your travel trailer- congratulations! But now what do you do with it??? Certainly, the very FIRST thing you have to do is bring it home. And if you're bringing it home, or to a campground, you have to park it. The next thing you need to know after parking your rig is that you HAVE TO LEVEL YOUR TRAVEL TRAILER as long as you are running your refrigerator. (Unless it's a residential refrigerator) Also, who wants to live in a home that's off-kilter? Leveling a travel trailer isn't so hard once you know how to level a travel trailer, but it can be a little intimidating at first. Mistakes will be made, it's only natural, so don't fret when you mess up. What is the procedure for how to level a travel trailer? Let's dig in. Well, if you're in a campground, you may not have much choice. Most campground spots are usually fairly level. 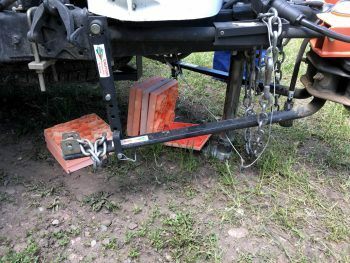 Trailer leveling is usually pretty easy to non-existent in campgrounds. If you aren't comfortable with backing your new trailer, you can choose to get a 'pull-through' spot. Usually its a little more expensive, but worth it in times of high-stress/tight quarters! If you are boondocking, you can find a spot using our guide to ﻿﻿boondocking. It's all about location, right? Unfortunately, if you are at a campground, you don't have much say as to where you park. But if you are boondocking, these factors are well within your control. Level: You're going to want to find a spot that's as level as you can find to start with. Solar: If you are using rooftop solar, consider positioning your travel trailer to get maximum sun on your panels. Refrigerator Needs: In hotter climates, some people will also park to deliberately keep the side of their rig that has the refrigerator shaded. 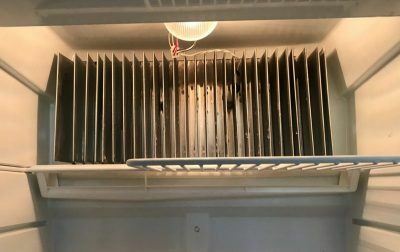 The most common type of RV refrigerator, an absorption refrigerator, has to work really hard to stay cool if it's very hot and facing the sun. View: You can consider positioning your rig so that your best windows have the best views. After all, that is likely a big reason you are boondocking! ​Neighborly Considerations: If you are boondocking with others, there's an unwritten rule to try not to park nearby with your door facing their door. This sometimes cannot be helped, but do try to do your best not to be 'staring' right at your neighbor if they were there first. I (Kelly) have a bad back, and sometimes when I crank, my back 'zings', warning me I'd better be more careful. An electric jack is in my future! Your rig might come with bubble levels pre-installed somewhere on the outside of your rig, or even on the inside. If not, you can purchase levels to stick onto the front and side of your rig so you can see where level is. 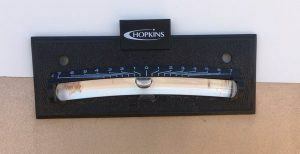 OR, since your refrigerator is the most important component of being level, you can use a bubble level in your fridge. However, it would be more than a pain to run into and out of your rig to check. Leveling with blocks: If you have blocks, or 'Lynx Levelers', ​place them in front of your tires on the side that needs to be lifted. You can put them in front of or behind your tires. You will have to guesstimate how many blocks to use to get to level. Get in your tow vehicle. Pull forward or backward until your tires are on top of the blocks. Then you have to check to see if you are level, or if you need more or less blocks to get level. If you aren't level, back off of the blocks, adjust them and try again.​ Once you are level, chock your wheels on the other side, you will disconnect your rig. Now you can level your travel trailer from front to back using your tongue (front) jack. Make sure your tongue jack has a 'foot' on it or you use some sort of blocks or stand for your jack so it doesn't sink into soft or wet ground. ​Boom, you're ready to start camping! Be Careful When Using X-Chocks! If you are using X-chocks and you have to raise your tongue jack very high, RE-TIGHTEN your X-chocks mid-way through the raising of the tongue. If you don't, the X-chocks can loosen, resulting in your rig rolling and your tongue falling off of your blocks. This happened to Camp Addict Marshall earlier this year. It was a scary learning experience, but luckily no-one was hurt. The aftermath. Tongue jack was on top of all of those levelers right before this photo was taken. This is how far forward it rolled! 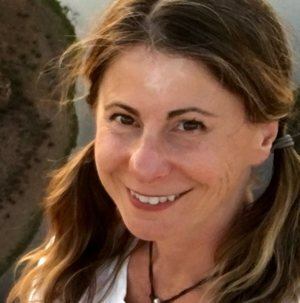 ​Leveling a travel trailer with Andersen Levelers: Andersen Levelers are such an ingenious leveling system, we can hardly stand it! It's basically trailer leveling made easy. This system eliminates the hassle of driving onto blocks, finding out you need more, having to drive off, add some and start over again. With the wedge system (Andersen Levelers), simply place the wedges in front of the tires that need to be lifted. Drive forward until your rig looks level or until your partner tells you you are level. Done! If alone, simply step out, check the level, and correct (pulling forwards or backwards) if necessary. No hassle with figuring out more blocks, or less blocks, and having to re-do the blocks. Simply back up more or pull forward more according to what your level is telling you. Once you are level, you must chock the levels themselves. We DO recommend having a spare pair of good chocks (or X-chocks) to chock the other side of your tires as well. Sometimes it is hard to tell which way your trailer will want to roll. If you chock the Andersen Levelers incorrectly, your rig might roll a little and become un-level again. Talk about convenient! This little puppy makes trailer leveling solo a breeze. The Level Mate Pro also helps if you have a very lazy partner who doesn't want to help with set-up. Or, if you're super controlling and want to do it all by yourself. ???? It's a little pricey, but if you have to, or choose to level on your own and have to do it a lot, then it may justify the price. There are other digital systems out there, but they are not as simple to use and don't cost much less. Now that you know how to level a travel trailer, just get out there and DO it! 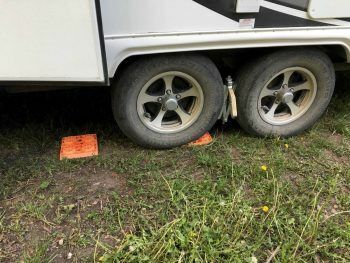 It's easy once you get the hang of it, and even easier now that you know how to level a travel trailer if you use the best tools out there- Andersen Levelers and either a (willing) partner or the Level Mate Pro!